The track travels through regenerating forest along a flat terrain for the first 5 minutes. It then drops down to enter some larger canopy trees such as totara, towai and tanekaha. The last 2 minutes walk is quite steep and slippery when wet as the track drops down to a tributary of the Pikiwahine Stream. The track ends at a railing and a viewing area. 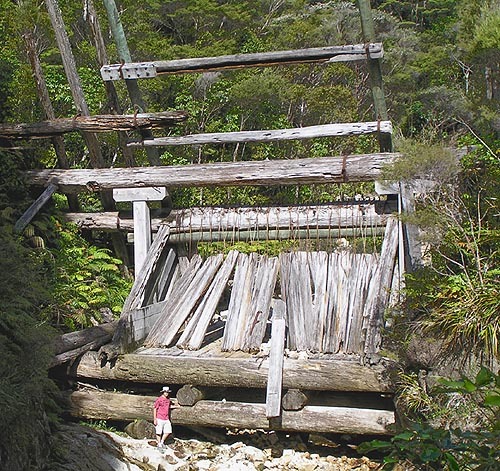 Kauri Dam Walk is in the Tangihua Forest, located halfway between Whangarei on Northland's east coast and Dargaville on the west coast. Your best access into Tangihua Forest is from Omana Road. The Omana Road Tangihua access car park has parking for 15 cars. You will need to walk 30 minutes along a formed road to the bush line. The Kauri Dam Walk enters the forest off the road to the Lions Lodge. You will find the entrance sign near the viewing platform and turnaround area.